Guanabana or Soursop also called Guyabano, Graviola, Annona and Muricata is known for it's curative and healing properties. Guanabana. 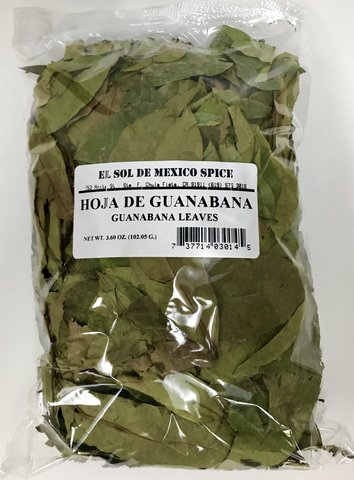 Note: Based on our inventory we ship El Sol de Mexico, Nayarit, Rancho Gonzalez or other Guanabana Leaves brand imported from Mexico. For every 16 oz of water add 1/4 of a cupBring freshly drawn, cold water to a boil. When water is at a gentle boil, remove heat and drink as preferred. Video about the properties of the Guanabana, Soursop, Graviola or Guyabano. Boil 1 liter of water, take 15 guanabana leaves (hojas de guanabana) or soursop dry leaves and 1 small stem, cut into small pieces and put into the boiling water. Continue to boil the water for 30 mins, until the water evaporates to 500 ml. The Guanabana tea is ready to drink. Drink 1 cup filtered guanabana tea hot, warm or cool, three times every day. Add 1/2 spoon of lime juice and honey for better taste. Take Guanabana tea 30 minutes before your meals. Nota: Nuestras Hojas de Guanabana en MexGrocer pueden venir en varias presentaciones seg�n la escasez del momento, siempre con la misma alta calidad y autenticidad. Entre las principales marcas que enviamos est�n: El Sol de Mexico, Nayarit y Rancho Gonzalez. 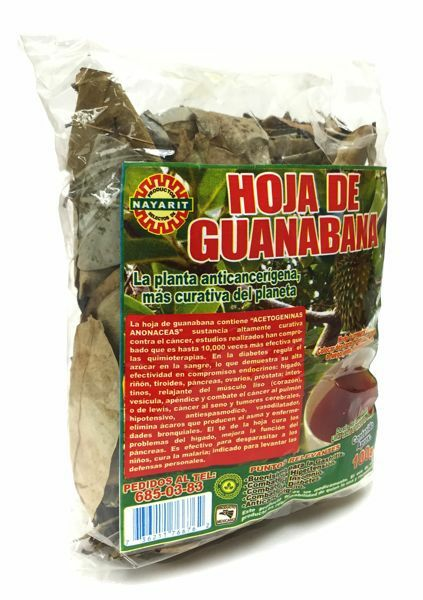 La hoja de guanabana, graviola o guyabano contiene acetogeninas anonaceas considerada como una alternativa para el tratamiento de cancer y ayuda a regular el azucar en la sangre. Otro uso herbal curativo de las hojas de guanavana es para el tratamiento de la gastritis, hipertension, insomnio y diabetes. Este no es un medicamento, y su eso es responsabilidad de que lo usa y recomienda. Modo de preparacion: En dos tazas de agua poner 13 hojas de guanabana y calentar a fuego lento sin llegar a hervir. Se recomienda tomar 3 tazas de te o infusion de guanabana al dia. En un litro de agua hirviendo, coloque 15 hojas de guanabana secas y un rabito de la hoja, deje que se consuma el agua a la mitad y tomese caliente, tivio o frio 3 veces al dia, 30 minutos antes de consumir alimentos. Repetir este procedimiento una vez consumido el recipiente conforme desee continuar con el tratamiento o consumo. Se le puede agregar miel de abeja y/o jugo de limon al gusto para un mejor sabor. This is definitely the miracle tea to treat any type of Cancer. I was diagnosed with Stage 4 Colon Cancer, I have been drinking this tea for a year now . It has helped me tremendously no stomach problems, also no body aches. I'm very satisfied. I rate this 10 stars. very satisfied with the products and services I received from Amanda at MexGrocer. My father was diagnosed with Stage 4 cancer (not sure what type because it was all over his body by the time it was detected). He drank this tea 2-3 times a day for almost a year and on his birthday last year he found out the cancer was gone. He continues to drink the tea to this day. Fast delivery. Tea really easy to make. Overall very happy w product. One of my closest girlfriends is using this tea during her chemo, and its helped with the side effects. I ordered his tea to help my sister who was diagnoised with breast cancer. So far the tea has helped her with the side effects from chemo as well. i am a Multiple Myeloma Patient from 2010 to now. I use this on a regular basis. I helps with back pain and bone pain. For a while there the dr i had dropped me so Iwas on no chemo. I believe this product brought me through fro almost a yr. As nyou may know Myeloma to this day is not curable. But these leaves u can boil and drink for tea will certainly bring you through, at least till you can getto medica attention if you think you may need it. Ive know people that take this and their tumors are gone. Even Breast tumors were gone. Prostate cancer.. .this guy had a holeabout 3 inches inside from the outside in...he took a pic I saw. 3 months later the hole was no longer there and his cancer was gone. The dr got mad at him due to the ffact he went against the regimen hed been given. But this man could not afford medical attention. Improved my health . Doing a lot better! I would gladly recommend this product to anyone in need. Also product was was shipped properly on time. I appreciate it. Thank you!! Will ordering soon.Thanks again.